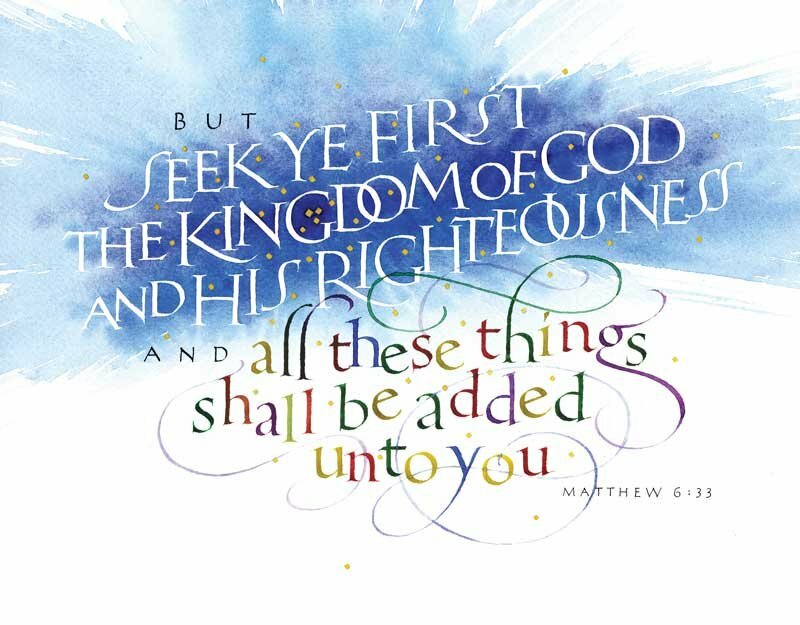 What does it mean to seek first the Kingdom of God and His righteousness? The Kingdom of God is the realm in which the righteous rule of the King of Kings is sovereign. Since the Word declares that the earth is the Lords and the fullness thereof - the world and they who dwell therein (Psalm 24:1), we are to understand that everything belongs to the Lord, but because of sin, because of will disobedience and rejection of God, everything is not submitted to the Lord. When we as Kingdom-minded men, men who have submitted our will to the will of God, like Jesus who declared in the garden of Gethsemane, "Not my will but thine be done," submit our very lives to Christ, we do things for the glory of God and the good of others. The decisions we make are for the glory of God and the good of others. Every thought that we think and every word that we speak is for the glory of God and the good of others. When God becomes the priority we find ourselves, in accordance with the promises of God, in a right place where blessings abound. Where does God's principle of first things first apply in your life? The ministry that the Lord has given us as Kingdom-minded men is to be a magnetic ministry that compels others to come into the Kingdom of God. In the scriptures we find David compelling others to join him in acknowledg-ing the splendor of a worthy God. He said: Oh magnify the Lord with me, and let us exalt his name together. Jesus told a parable to his disciples that communicates how we are to usher others into joyful relationship with the King. 1. We are called to go out. Many of us have been complacent to the point that we expect others to just come, but how many times have you gone to places were you were not invited and welcomed? 2. We are called to go beyond our comfort zones. After the friends and neighbors of the master have forsaken the privilege to sit and celebrate with the Master, the servants are instructed to go out beyond the places of normalcy. They are called to a different demographic as well as a different location along with a heightened sense of urgency! 3. 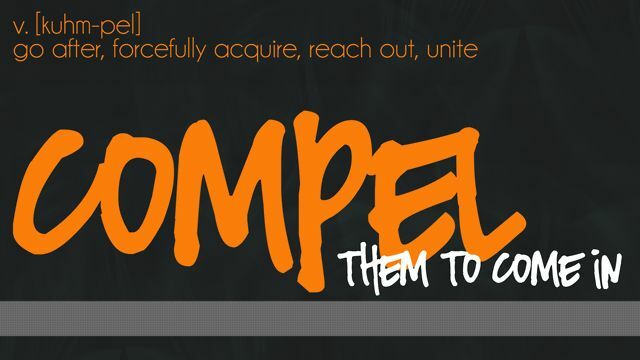 We are called to compel. As servants of God we are called to a sense of urgency that moves beyond an invitation to those who had been used to sitting at the Lord's table, but have now chosen new priorities over the ultimate privilege. We are called to compel others to come into the presence of the Lord. In our faith context that power to compel comes not just through words, but by our spirit fueled and directed deeds also. The submitting of our lives to Christ, affords us the privilege to be lead by the Spirit and shine the light of God placed in us that has a drawing and magnetic effect toward the Lord. 4. Called to be instruments of filling. The Master chooses to use us as instruments for His glory. We have been chosen and called out to go out and compel others to come to the table set for them. Those that come shall be filled even as the house of God would indeed be filled. In what ways are you engaging in magnetic ministry? keep his way pure, and that is where our discussion begins. After careful honest consideration one comes to the realization that we really do need a savior! Realize that our savior has made a way for us to walk in accordance with his will. Accept God's way of escape - Meditate on God's Word. Let it illuminate your path. Practice God's Word, and walk by faith - not by sight. When we think of relationship with God, certainly we think of those that are followers of Christ; those that believe and put their trust in God - believers. We also consider our own state when we think about those that don't put their trust in the Lord. As well as those who want to, believe in God, but love the world and the things that are in enmity with God more. We think of unbelievers. But how often do we consider the position of one known as worse than an unbeliever. God inspires Paul to speak about the state of a man who will not take care of his family as worse than an unbeliever! The scripture specifically says, "But if anyone does not provide for his own, and especially for those of his household, he has denied the faith, and is worse than an unbeliever"
In the book of Luke and the fifth chapter we find Jesus coming aboard the boat of a fisherman named Peter. After instructing Simon Peter move them out from the land a bit, he further instructs Peter to let down his nets for a draught of fish. Peter, a professional fisherman had been toiling at the task all day without results, and apprehensively let down his nets. To his surprise he received a catch that he could not handle on his own, and even lost a few in the process. There are a many precious nuggets that we can glean from this scripture today, but we will focus on a few. I believe this is a season where the Lord is speaking directly to many of us, telling us to cast out our nets for a catch! The craziness of it all is that you already know this, because you heard it yourself. The handwriting is on the wall, on your bathroom window, on the road signs as you travel, and certainly in your Bible! Now is the time! "What do I do? Where do I start?" You ask. I repeat, "Start with what's in your hands!" 1. Get a pen and pad to create your "vision book." 2. Write the vision, and make it plain (See Habakkuk 2). 3. Write down the steps you believe need to be made to bring it to fruition. who will stretch you and support your vision. 5. Rid yourself of all distractions, negative thoughts, people, and practices. 6. Prioritize the steps in short term and long term categories. 7. Give yourself specific dates or benchmarks to complete each step. 8. Schedule times to meet with your accountability team to report progress. 9. Ask your team for feedback AND CONSIDER THEIR INPUT. 10. Commit to yourself that you will give it all you've got for thirty days, and share your story with us, and others. Be honest with yourself and your team. Take the time and really do the work. Don't quit when it gets rough. You will make a catch that will exceed your expectations. The Lord has brought to our consideration, through the various studies that we have been privileged to engage, Kingdom Principles that we should apply to every fabric of our lives as Kingdom-minded men. We have placed them hear for our reflection and preparation for practice. As Kingdom-minded people of God we are to prioritize everything we do with the righteous rule of God in mind. The righteous rule of God is God's will in action in our lives. We begin to understand God's will through the counsel of God's commandments, God's precepts, through God's Word. So the seeking of the Kingdom or the righteous will of God hinges on our willingness to acquiesce to the will of God. Jesus teaches us that the commandments are summed up in loving God with every fabric of our being, and loving others as we would ourselves. Later even pronouncing a new commandment to love others as Christ loved us! Thus, the questions that precipitate the position and posture of this principle are: Do the actions that I am about to take, and does the position I find myself in even now, bring glory to God, and is it for the good of others? God intends to reveal God self to the people of God as we engage the marvelous invitation to be with God. We are also given the privilege to glimpse into the infinity of God's sight, and into the mind and will of God. The view is obscure at times, because of the sovereignty of God, as well as our willingness to surrender to His command to "behold" to "look and see." Thus we are to appropriate that vision from thought to fruition is what we find in this Kingdom principle. Write the vision make it plain so that those who see it will run and not give up before it comes to pass. The vision that God gives shall come to pass, but to appropriate it we must strategize so as not to wear out before it has been grasped. This concept leads us to mission. Vision is what God has allowed us and inspired us to see. Mission is the implementation of the action plan necessary to see the vision become reality. God has given unto us every seed bearing tree for us to prosper in life. Application: You will receive the fruit of what you have planted later than you planted, and greater than the seed you planted. Expansion: If you want an orange, you know you must go to an orange tree to obtain it. But the tree is there, because an orange seed was planted. The same applies to the apple, the lemon, and so forth. What we must remember then, is that we have also been given the privilege and responsibility to plant spiritual seeds. Thus love is accessed from the Love tree. It is produced by the Love seed, which is the Word of God. The principle of seed and harvest is applicable to every fabric of our lives; including our families, our finances, and our future.